In 1953 certain friends of Chigwell School, where Mr. Stott had been a Housemaster before coming to Sargodha got together and as a gesture of goodwill sent a challenge shield for all Inter House games activities. The shield carries the Sargodha badge in the top left hand (heraldically the position of the honour) and the Chigwell badge in the right top corner; the latter is the joint coat of arms of an Archbishop of York and the Founder of Chigwell School and dates from 1629, This shield was won first in 1954 by Tempest and Fury Houses together. When the school resumed its old public school role in 1990, the Chigwell Trophy was reserved for Senior Sports. Tempest House was the first to win the shield after revival. 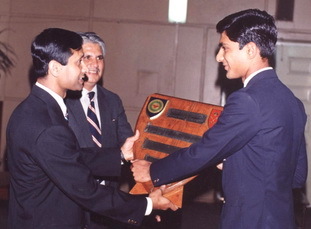 Shahzad Nasar (1319-T) "the Best Sportsman of the Year" received it from the then Commandant Air Cdre Syed Imtiaz Hyder (457-T).